1. Even though the long term trend may appear rather smooth, price patterns can factually be rather lumpy in the short term. This creates opportunities for purchasing and selling given shorter to medium term goals; not to mention that it can save or make you a lot of money. 2. The rate of increases in property value becomes very large as they are measured off of the short term price drops--thus reinforcing the first point that appreciation potential becomes most pivotal when taking advantage of dips. 3. It's not just a matter of magnitude, but that of duration. 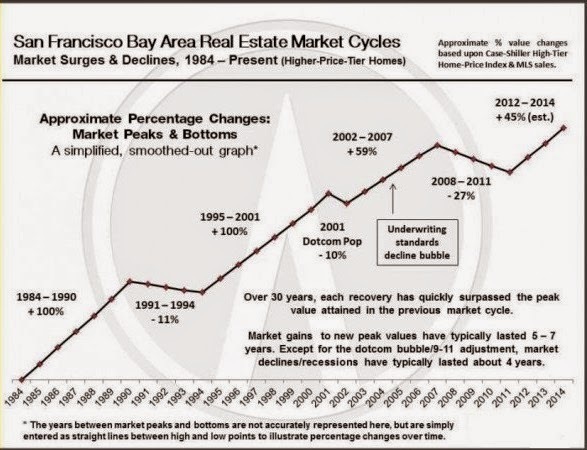 During the Savings and Loans crisis of the early 90's: SF property, by and large, lost a total value of 11%. However, when considering the duration--that only amounted to 2.9% per year--which is not a rate steep enough to warrant panic. This is an example of low magnitude with a longer duration. Then we look at 2001: in this example we have the opposite effect--a larger magnitude but a shorter duration. Even though the annualized price depreciation was steeper--the time period was short enough that a very busy person would most likely have never noticed it! 4. Finally, this data doesn't even consider the greater context of it all! Transplanting this information relative to: demographic trends, local GDP growth, newer and established industry growth (i.e. Tech), and everything else that causes demand to grow in the Bay Area then the story makes so much more sense why the performance speaks for itself.